After pulling off a blockbuster trade for Chris Sale, most consider the Boston Red Sox to be one of the biggest winners of the hot stove season. Such a high-profile addition has raised expectations for the Red Sox on the heels of an AL East championship in 2016. Despite an early exit in last year’s postseason and the loss of David Ortiz to retirement, the Red Sox will fancy themselves as World Series contenders heading into 2017, but are they? With the addition of Sale, the Red Sox now have three former Cy Young winners in their starting rotation. David Price will need to have a bounce-back year after struggling in his first season in Boston, and Rick Porcello will need to avoid a significant drop-off after his Cy Young last season, but talent-wise, Sale, Price, and Porcello are as good as any trio in baseball. Even the back end of Boston’s rotation is loaded with talent, as both Steven Wright and Drew Pomeranz were all-stars last season. The Red Sox are also high on Eduardo Rodriguez, as the 23-year old lefty posted a 3.24 ERA over his final 14 starts of 2016. There are some health concerns among the group, but if everyone stays healthy, the Red Sox should have one of the deepest and most talented rotations in baseball in 2017. The Red Sox were solid in the bullpen last season, although there has been quite a bit of turnover over the winter. Craig Kimbrel returns as the closer, but he posted the highest ERA of his career last season, so there’s no guarantee he returns to being the dominant closer he once was. The good news is that the Red Sox have a strong contingent of setup men lined up in front of Kimbrel. The acquisition of Tyler Thornburg gives Boston one of the top 8th-inning relievers in baseball, as well as a safety net just in case Kimbrel continues his recent decline. In addition to Thornbrug, Joe Kelly and Robbie Ross Jr. were both outstanding the second half of last season and they should continue to be reliable bullpen pieces this year, giving the Red Sox bullpen considerable depth. It may not be the best bullpen in baseball, but the Red Sox should feel good about it heading into the season. Boston’s Killer B’s are back in 2017, and they may be better than ever, especially with Andrew Benintendi becoming a full-time member. He completes what could be the best outfield in baseball on both sides of the ball. Just in case they need him, veteran Chris Young is still around to provide depth after a productive, albeit injury-plagued, 2016 season. The Red Sox infield will take on a different look than last year, but Xander Bogaerts and Dustin Pedroia remain one of the best middle-infield tandems in the game. The question is whether the return of Pablo Sandoval at third base and addition of Mitch Moreland at first base will be enough to replace Ortiz. Sandoval, in particular, is a huge X-factor for the Red Sox this year. Boston is also banking on veteran Hanley Ramirez having another monster season after producing 30 home runs and 111 RBIs a year ago. From top to bottom, there are a few spots of uncertainty heading into the season, most notably Sandoval. However, it’d be difficult to find a lineup in baseball with a higher upside than the one in Boston. All the pieces are in place for the Red Sox to have a special season in 2017. Even without Ortiz around to anchor the lineup, the Red Sox should have no problem scoring runs this year. Meanwhile, Boston’s pitching staff has a chance to be one of the best in baseball. Of course, there are questions about the team’s pitching. Also, the team will have to handle the high expectations it has heading into the season. The Red Sox will finish 90-72 this season, just a few wins short of last year’s 93 wins. 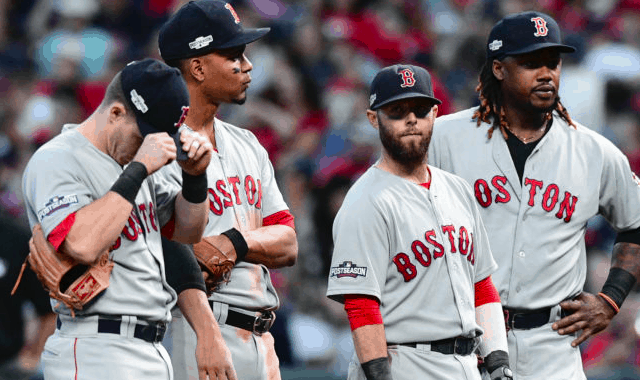 Despite a slight decline in wins, Boston will remain on top of the AL East and be a serious contender in the postseason.